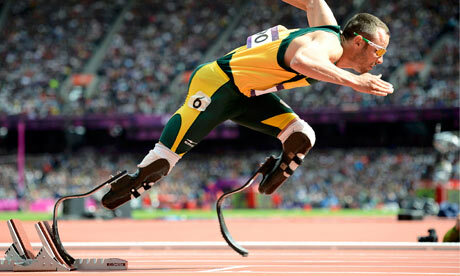 Can prosthetics be an unfair advantage? | Abler. Here’s Part I of a great discussion of the ways prosthetics—in their ever more sophisticated forms—are raising ethical questions about bodily augmentation and mechanical advantage. The image is of Oscar Pistorius, an athlete and bilateral amputee who’s been able to seriously compete against both able-legged runners and at the Paralympics.